Dixie Chopper is an interesting brand of mower. Geared primarily towards commercial users, these machines appear to be very well designed. Only one model series is aimed towards the residential owner. The manufacturer's website does not contain the detailed product information seen on most competitors’ sites, but there are videos that allow the consumer to see these mowers in action. All the Dixie Chopper ZTR mowers feature the ‘3 in 1’ option,allowing for side discharge, mulch, or rear bagging. The deck cutting height is adjusted manually using a foot control. The frames are fully welded steel ( no bolts and nuts to come loose, compromising the frame strength). The more expensive models feature a 1.5” tubular steel frame, which gives added strength and stability. 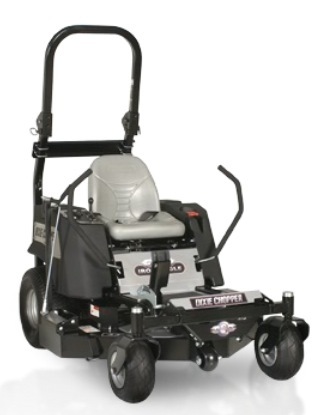 Dixie Chopper ZTR mowers are available in 1 model series for the residential customer - the Iron Eagle. This has 3 different cutting deck widths to choose from, with a different engine option for each. There are no details concerning the transmission type installed on the Iron Eagle. Chances are good it is equipped with Hydro-Gear units, since this is currently the industry standard for Residential ZTR mowers. The Iron Eagle offers a choice between Kohler engines. Horsepower ranges from 20 HP ( single cylinder) to 25 HP (twin cylinder). Both versions of the engine feature a pressurized oil system, with a replaceable oil filter. There are dual lap bars controlling speed and direction. Steering dampeners help provide a smoother ride. All the Iron Eagle mowers have an electric PTO to engage the cutting blades, which is activated by flipping a switch. The cutting deck is fabricated steel. Adjusting the deck height is accomplished by a foot lever. Dixie Chopper has an interesting feature not found on any other ZTR mower. The side discharge chute can be closed by the operator while mowing. This is safely accomplished using a hand lever. Known as the “Operator Controlled Discharge Chute ( or OCDC), this is a nice feature when mowing near flower beds or sidewalks, when the grass being discharged from the deck would be considered a nuisance. Model 2044 comes with a 44” twin blade cutting deck, and is powered by the lower horsepower 20 HP single cylinder engine. Model 2350 has a 3 blade 50” cutting deck, with the 23HP engine. To continue the trend, 2560 powers a deck that leaves an impressive 60” swath. Check out the 25 HP engine, which delivers ‘take no prisoners’ power and performance. Contact your local Dealer for prices. Dixie Chopper appears to make an excellent ZTR mower, with some innovative features not found on other machines.